java2practice | Java and Angular and so on……!!! Welcome to Angular Family, It is one of the most power full and faster framework developed by Google. One of its feature is Single Page Application(SPA), It has only one index.html in entire application, Whatever we use all other htmls will include in main index.html. As it is Single Page Application, there is no browser reload. We will get know all the things in the later sections. Now we will proceed with the installation of angular 4, We will see the basic angular 4 program in Type script. First we need to install the node.js to get access of npm commands. Verify that you are running node v4.x.x or higher and npm 3.x.x or higher by running the commands node -v and npm -v in a terminal/console window. Other below node versions will produce errors. iii) Download the visual studio for better writing angular code from below website. Install the Angular CLI Globally. 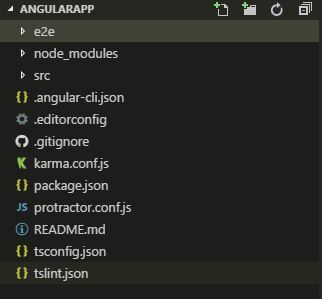 You need to install the angular cli(command line interface) to use the ng command. It will use to create the angular project. And type below command to download the dependencies of your package.json file. 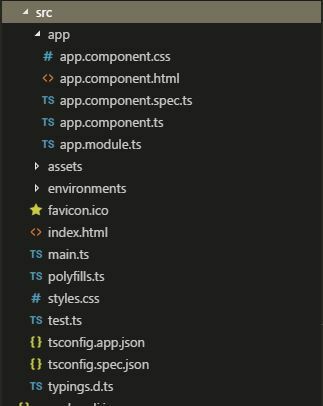 you will see the node-modules folder above src folder of your project. Just type the below command in your terminal to launch the server.